Dress conventional and vitrified Superabrasive grinding wheels on CNC grinding machines for either straight or form dressing. 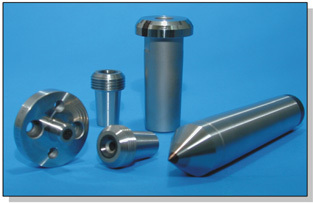 RIG tools are plated diamond tools with a single layer of diamond attached by a nickel bond to a steel body. RI tools have a thick layer that is impregnated with diamond grit for longer life. 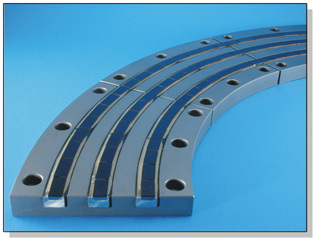 RI tools can be shaped during manufacture with precise profiles. 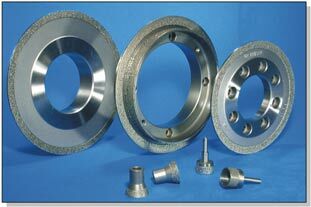 Rotary Diamond dressing tools are used for profiling gear grinding wheels. Their module range is from 0.35mm to 10mm (72 to 2.54 DP). The latest generation gear dressers use PCD reinforcing of the dresser tip on a direct-plated diamond dresser. Diamond Dressing Systems are usable for Fassler, Hamada, Gleason, Kapp, Liebherr, Okamoto, Reishauer, and Samputtensili gear grinding machines. These tools can generally be reconditioned by either relapping or replating. 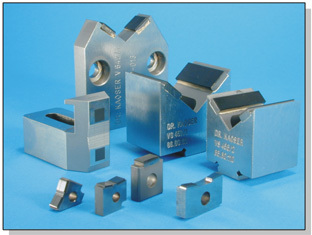 MCD Dressers are stationary dressing tools with monocrystalline diamond for dressing complex profiles and radii on grinding wheels. 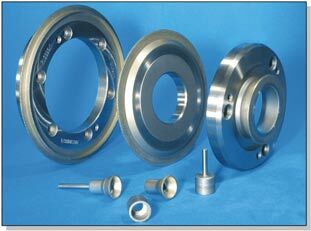 They provide long life, stability, and repeatability, especially when dressing ceramic abrasive wheels. 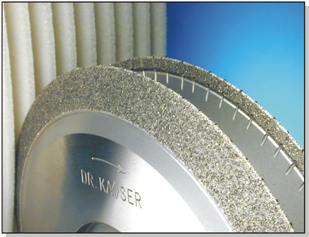 Dr. Kaiser provides custom made Workrest Blades for all major brands of Centerless Grinders. Dr. Kaiser blades can improve geometrical and dimensional accuracies and surface finish on components. Blades are available with Eddy-Current Sensors for in-process inspection of ground workpiece surfaces on thru-feed grinding.